2017. Strengthening Electoral Integrity. New York: Cambridge University Press. (Aug) ISBN: 9781107681668. Many elections around the world fail to meet international standards. What works to fix common problems? And what solutions prove most effective? This final volume in the trilogy confronts the general mood of resigned pessimism surrounding efforts to strengthen elections and democracy. The fatalistic zeitgeist suggests that the authoritarian tide cannot be halted or reversed abroad and elections, democracy and human rights are vulnerable to new threats even in Western societies. Donald Trump calls American attempts to build democracy abroad a dangerous mistake triggering instability and chaos from Iraq to Egypt, Libya and Syria. European aid for democratic governance programs has been slashed, with resources reassigned to deal with the migration crisis at home. Several indicators suggest that democracy is in decline worldwide. 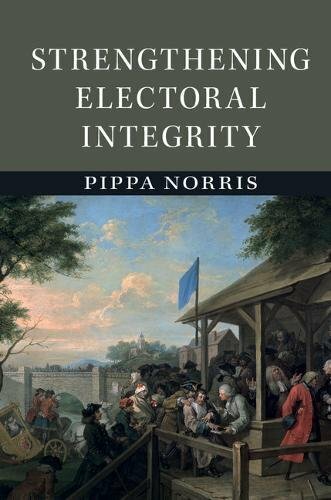 To counter the prevailing ethos, this book presents the pragmatic case demonstrating that, in fact, several common types of electoral assistance work. Practical programs are most effective where international organizations and bilateral donors support local stakeholders – including in efforts to reform electoral laws, strengthen women’s representation, foster independent journalism, regulate money in politics, and improve voter registration. Success should not be exaggerated. Not everything works, by any means. The strengths and weaknesses of aid agencies need to match the opportunities and threats they face on the ground. Electoral problems need more than technical fixes - political will is often lacking. Even small flaws in contests can erode public confidence – and it is difficult to restore. Most aid is often invested in the riskiest contexts. Expectations are commonly inflated. Agencies need better evidence to evaluate programs. New electoral risks metastasize, including from lapses in cybersecurity, disinformation campaigns, and the rise of populist authoritarianism. But just because it’s difficult, does not mean that attempts to strengthen free and fair elections at home and abroad should be abandoned. Since 1948, the international community and Western leaders been committed to the values of freedom and democracy. At a time of authoritarian resurgence, far from cynical retreat, or fatalistic resignation, it is even more important for democrats to redouble efforts to defend electoral integrity.